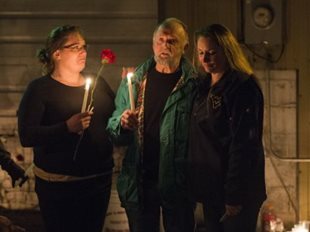 Friends of the late Jody Hunt, Ashley Ice (left) and Kerri Everd (right), console Hunt’s uncle, Jim Forsythe, at a vigil held for Hunt on Wednesday, Dec. 3, at J&J Towing and Repair in Westover. MORGANTOWN, W.Va. — Friends and family of Jody Hunt held a vigil Wednesday, Dec. 3, to remember the man they knew, not the killer. “Our Jody wasn’t that man,” said Kerri Everd, a friend of Hunt’s. Hunt shot and killed four people during a three-site shooting rampage on Monday, Dec. 1. Sharon Kay Berkshire, 39, of Westover, Michael David Frum, 28, of Maidsville, were shot at a residence off Sunset Beach Road in Cheat Lake. Jody Taylor, 43, was shot at a residence off Sweet Pea Lane. Doug Brady, owner of Doug’s Towing was shot at his Dunkard Avenue shop.